The "chemtrail" story has become so huge that we can’t describe it in mere words. All we can do is "imagine" it. So, close your eyes and take a deep breath—wait don’t take a deep breath because we can’t do that anymore. Let’s try again: Close your eyes and clear your mind (try to ignore the constant ringing in your ears and your chronic pains). Now imagine the ionosphere, the stratosphere and the troposphere; imagine all the oceans, seas, lakes and rivers; imagine all the islands and continents and their mountains and valleys, gorges and canyons, deserts and rainforests, badlands and scablands, the frozen arctic and frozen antarctic; now imagine the depths to which man has drilled into the earth and the heights to which man has reached in outer space. Now that you have "imagined" the heights, depths and breadths of our world, you can grasp how big the chemtrail "story" has become. Smallstorm, who previously produced the highly acclaimed documentary 9/11 Mysteries (2006) has immersed herself in the global chemtrail emergency. According to Smallstorm, "The [chemtrail] spraying is part of an integrated atmospheric weapons system. Though it seems the program is currently about weather modification, the aerosols contain nano-engineered biologics, or weaponized parasites. According to those who have done the research, we are virtually all infected. Perhaps ‘seeded’ would be a better word. "The mix of engineered parasites, pathogens, toxic heavy metals and nanobots is designed to assemble within us to create a microchipped terrain. Never mind the dog-and-pony-show discussion about future RFID (radio frequency identification) tags. It’s already done." Carnicom’s intuitive research and lucid analyses prove his qualifications as a scientist who believes that, "The saturation [of our atmosphere via aerosol operations] is complete. It is now a matter of maintenance and concentration." In the abstract to her 2007 research paper "Chemical foreign invaders," Dr. Staninger gave Morgellons a chilling description: "It is silent, smart, glistening—powered by its own transitional metal battery. And when it strikes its victim it feels like a piece of burning broken glass as it pierces the skin. Smaller than any of the 150 pieces of a virus (known as virons), it is invisible to the naked eye. So silent is it, only the one who has been invaded knows its true nature. Marked with the seal of man-made, self-assembling nano-size materials, they can be used in forming drugs, pharmaceuticals, chemicals, biomaterials, artificial nerves, artificial brains, pseudo skin and molecular electronics. Yes, it was patterned after nature’s many wonders, but it is still one hundred percent man-made. The nano-brew has been let loose from its scientific flask casting its woes upon an unsuspecting innocence." Some of Carnicom’s more recent research shows that the airborne chemtrail fibers and the fibers found in the tissues of a patient with advanced Morgellons Disease match. Additionally, the unusual airborne blood cell samples have been found to match the unusual blood cells in Morgellons-infected individuals. It is ironic that Al Gore, et al., has been blaming global warming on CO2 (an element) without ever mentioning the global deployment of toxic man-made particulates via aerosol operations. While the global warming debate is more political and emotional than scientific, scientists measuring the amount of sunlight reaching the earth’s surface have been concurring that a process of global dimming has been ongoing for the last several decades. Global dimming is evidenced by diminished output of electricity generated by solar panels and a reduction in plant productivity through decreased photosynthesis. Potential complications from global dimming are food chain interruptions from crop failures and weather problems from decreased water evaporation. However, we can’t believe that because there would be no reason to go on living; we can’t act as if there is no hope because there are millions of children whose futures depend upon our cleaning up this horrible mess. Biologic components have been reported in airborne samples that include modified molds, desiccated red blood cells and exotic strains of bacteria. Additionally, award winning investigative reporter, Will Thomas, has reported findings of over 300 types of virally-mutated fungi in the chemtrail fall out. The IO reported in July, 2006, that analysis of chemtrail fallout in Iowa revealed traces of 26 known toxins including barium, aluminum and uranium, a variety of infectious pathogens, chemicals and drugs including sedatives. The government admits to deploying "military chaff" (fiberglass-coated aluminum particles) when air force pilots are training in U.S. airspace. Dr.R. Michael Castle reports the finding of cationic polymer fibers. Others have reported findings of tiny parasitic nematode eggs of some type encased in the fibers. Researcher Clifford Carnicom has reported finding chemtrail fibers that are an exact match with the bizarre fibers found in those suffering from Morgellons disease. Welcome to the brave new world of toxic skies, weather control, mind control and population control through the use of chemtrails modulated with electromagnetic frequencies generated by HAARP. 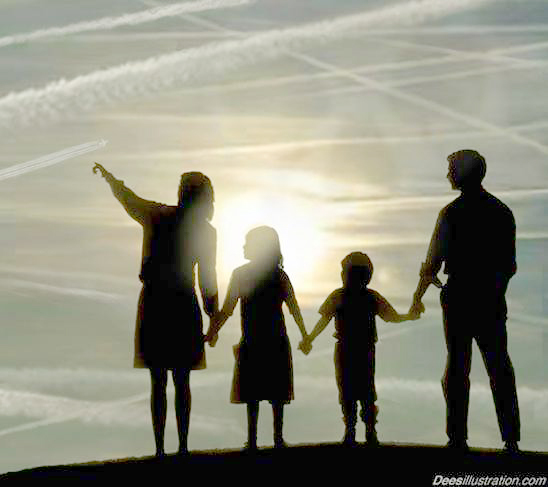 Our health is under attack as evidenced by the skyrocketing rates of chemtrail-induced lung cancer, asthma and pulmonary/respiratory problems as well as the emergence of a new plague, Morgellons disease, an infection of unknown pathology that has been diagnosed in an estimated 60,000 Americans in over 12,000 families in the U.S. There is a corporate media blackout on this subject and public officials are either unable or unwilling to do or say anything about the fact that our entire planet is covered in a thick toxic haze. We are on our own. The only way to sound the alarm is by word of mouth. People are already dying because of the chemtrails. Life expectancy is down. This situation presents an immediate and serious threat to you, your family and loved ones. 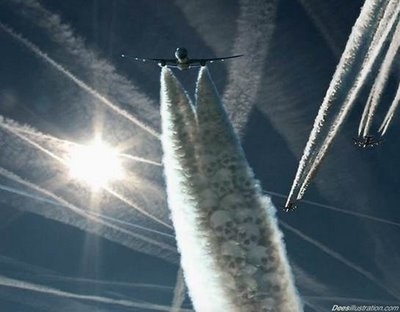 We must join together to stop this insane program of chemtrail spraying now. Please do what you can to help.